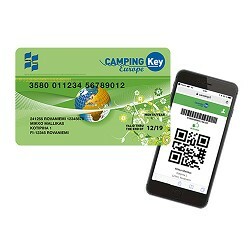 DO YOU ALREADY HAVE THE NEW CAMPING KEY EUROPE CARD? 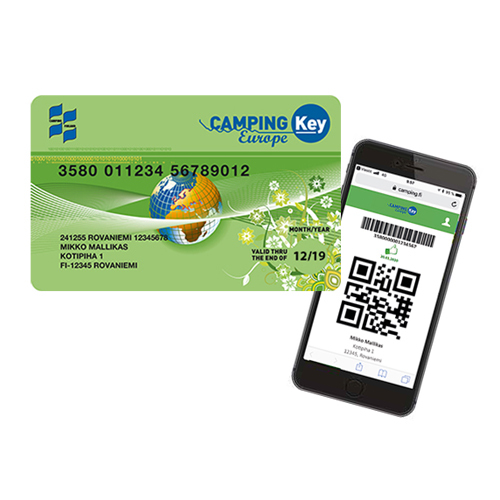 Camping Key Europe (CKE) is a new benefits/identity card replacing the previously used Camping Card Scandinavia and it is recognised in camping sites and holiday villages throughout Europe. CKE is family specific and grants its holders numerous benefits and discounts on accommodation and extra services in camping sites and holiday villages. The card costs €16. A valid CKE card includes a family-specific accident and liability insurance which is recognised by all the camping sites and holiday villages introduced in this web page. Our insurance Company is ERV. The cards are issued by the Finnish Camping Site Association’s 140 member sites across Finland. By purchasing your own CKE with the annual validation stamp at the first camping site you visit, you can start enjoying the benefits straight away. The stamp costs €16 and it is valid for a calendar year. If you do not have an annual stamp, you can buy one as soon as you arrive at a camping site or holiday village. A valid CKE card grants you camping fee credit for up to seven days so that you can pay for your camping fees at the end of your visit. The credit only applies to camping fees, whereas fees for renting a cottage are normally paid upon arrival. CKE lets you enjoy benefits and discounts at camping sites and holiday villages. The benefits introduced in our web page are valid until the end of 2019 only upon presentation of a valid CKE card. The benefits can be found listed in this brochure by each camping site/holiday village. In addition, CKE includes an accident and liability insurance which covers your whole family at a camping site or holiday village. The insurance benefit is excellent considering the cost of the card (€16)and the extensiveness of the benefit. The insurance covers guests and their family (one or two adults and their children) checked in at any of the Finnish Camping Site Association’s member sites. For instance, if two adult couples are staying in the same vehicle or tent, both couples need a valid CKE card in order to be covered by the insurance. The CKE card system is recognised in several European countries. This year the card is welcomed in camping sites in the following countries: Belgium, Spain, Netherlands, Ireland, United Kingdom, Italy, Greece, Croatia, Latvia, Luxemburg, Norway, Portugal, France, Sweden, Germany, Slovenia, Finland, Switzerland, Denmark and Hungary. Remember to present your CKE card upon arrival at any camping site in these countries. Where Can I Get a CKE Card? CKE cards are issued by the camping sites and holiday villages introduced in this web page. Alternatively, you can buy it Online from our web page.